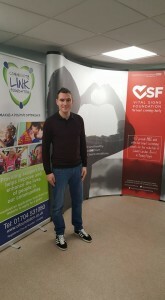 CLF and VSF Heart Screening at Southport College | Making a positive difference! Community Link Foundation was delighted to support Vital Signs Foundation to put on a heart screening event at the weekend. The event was held at Southport College on Saturday, March 5 and just over 100 people aged between 15 and 35 attended. 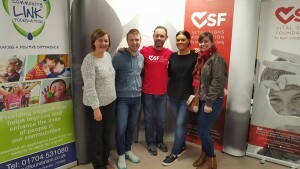 The attendees were screened with a simple ECG procedure, in partnership with the Liverpool Heart and Chest Hospital, that can detect previously undetected heart conditions. Vital Signs Foundation applied to Community Link Foundation for a grant at the end of last year so that they could put on the event that anyone within the specified age group could sign up to attend. Dan Brown, who lives in Ainsdale, was one of the first people to be screened at the event. Vital Signs Foundation was set up by Steve Haw, after his son, Chris Haw, tragically died at the age of 25. He was a fit and healthy young man but he had an undiagnosed heart condition. Steve started the charity following Chris’ death, to offer heart screening to people aged between 15 and 35 for undiagnosed heart conditions. As well as delivering the heart screenings, attendees were also given training and familiarisation in CPR and how to use a defibrillator. If you would like more information on how to apply for a grant from Community Link Foundation, please email nkenyon@clfoundation.co.uk or go to www.clfoundation.co.uk. Pictured left to right: Sharon Twist, Patrick Shaughnessy, Tony Bennett (VSF Trustee), Ashleigh Leggett, Laura Keir.